I can truthfully say I would not have made it through Arizona, if not for Liz! We met early this morning when it was already 90+ degrees. 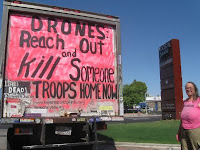 Liz took me to the site of many Phoenix CodePINK demonstrations, Mr. John McCain's office! Then we proceeded to the statue constructed from thousands of melted and smashed weapons that had been involved in acts of violence in Arizona. It was quite powerful. We visited the local organic coffee shop, also the scene of many CodePINK meetings and soon to be home to a documentary film series Liz is working on. Liz is our awesome Phoenix coordinator who IS CodePINK Phoenix! She works tirelessly and tremendously, not just organizing CodePINK and anti-war actions, but also connecting with the progressives and working people, making those strong alliances that we need to work together, to see the big picture, to forge community and allies as we change our world. It is 107 degrees now and not yet noon. Liz takes me home with her, I meet her kind father, and allows me to spend the afternoon hanging out in the neighborhood swimming pool - a pool that is deserted except for me.